Lord, I don’t know how I am going to do this, I do not even know how to pray. Most likely, God will give you an idea and you will think you came up with it. Ideas like, to pray for things or people we never think of; usually we find later that we interceded in prayer for someone else and the prayer was necessary to stop an attack of the enemy. Other times, we receive ideas and strategies which God puts in our hearts, and its just too good to be true: these are God given inspirations ad promptings. Now, the Holy Spirit does not make a robot out of us, He works with our personality, but His agenda is to reshape our thinking, our character. Jesus commanded us to preach the gospel to all nations, and to make disciples and baptize them in THE NAME of the Father, the Son and the Holy Spirit. If they were different the word should says in the names, plural. Another thing we should know, is that God’s Spirit will not have us do anything that goes against His word. For example, one day before I knew the leading of Holy Spirit, as I left my house something told me (my gut) : take the gospel tracts with you, but I did not because I reasoned with myself that I was going to church and I would use the tracts they have there. When I got to the church it was closed. And I told my sister in Christ, an elder, that something told me to bring my tracts and I didn’t- she laughed and she said your flesh nor Satan would ever tell you to use your gospel tracts, you should have known that was God’s Holy Spirit. God is an ever present help in time of need. Another way to know God is leading you, is by the “fruit” of our every day life, those are our attitudes and decisions. We determine if our mind thinks according to God’s character or our fleshly animal instinct: , “the fruit of the Spirit is love, joy, peace, patience, kindness, goodness, faithfulness, gentleness and self-control.” (Galatians 5:22-23) This is what is born in us when God’s Holy Spirit is increased in our lives, He is like a seed in our bellies which bears fruit: like an apple seed, gives fruit. Holy Spirit, my bestie, my comforter , my lover the one who puts up with all of my nonsense. 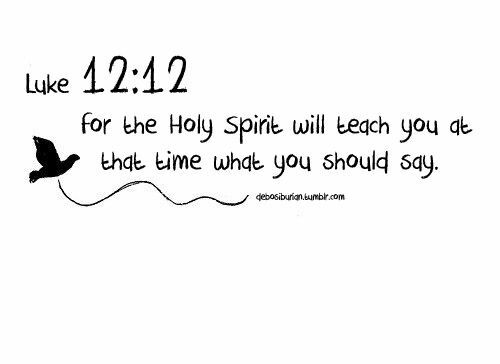 Holy Spirit, the one who does not shy away from evil, chaos or darkness, my guide and liberator of my soul. Forgive me God, for my own rebellion and neglect of your presence, for my filthiness in your temple. I am sorry for being selfish. May you become greater, in us, as the days go on. May your love for us be revealed and known to us. May you voice be so loud to us that we may not miss it. May your will be so peaceful that we may be drawn towards it. In Jesus mighty name, Amen.